​Steve Tibbetts: guitar,piano; Marc Anderson: percussion, handpan; Michelle Kinney: cello, drones. Guitarist Steve Tibbetts, who has had an association with ECM over 30 years, is one the stable’s artists that defy category. Like Stephan Micus, David Torn and Jon Balke the listener should forget about categories and just enjoy the mood they create. Life Of represents the guitarist’s first album since Natural Causes (2010)and is mainly Tibbetts’ solo on 12 string guitar and piano, but he is assisted on select tracks by the percussion and handpan of long time associate Marc Anderson, and Michelle Kinney on cello. Life Of presents thirteen pieces based on people close to him or people he has observed in places like coffee shops over the years. Many pieces run in the one to five and a half minute range with the closing “Starting Again” clocking in at 9:06, and each is an evocative, engaging sound sculpture that could function as a personalized soundtrack for the listener. There is a strong essence of North African flavor to many of the pieces, Moroccan to be specific, and an Indonesian gamelan component. Tibbetts’ piano playing is very reminiscent of gamelan music and the effect is heightened by his use of sampled metallophones (triggered from a second 12 string guitar) that he captured in Bali and Kinney’s drones. For example the track “The Life of Joel” has subtle traces of metallic instruments wafting from underneath his richly textured Martin 12 string guitar while also sharing a melodic cel with the preceding “The Life of Lowell”. Anderson’s handpan use further the connection to gamelan in “The Life of Alice” with their long, resonant temple bell like tones and scurrying triplet patterns. The opening “Bloodwork” inspired by a medical procedure that Tibbetts went through to aide his sister is striking for it’s ability to conjure up the feelings associated with such an undertaking. The beauty of Tibbett’s slowly revolving piano, Anderson’s percussion, and the Roland D-50 like pad are underscored by a slightly apprehensive guitar melody, it’s swirls approximating blood platelets being separated by a machine. Anderson’s percussion is another beautiful feature of “Life Of Dot” again evoking a quiet Theravada Buddhist temple esque tranquility that wraps the listener in warmth. On tracks like “Life of Mir”, the synth pads and Michelle Kinney’s cello thicken the dense textures with slightly muted colors. 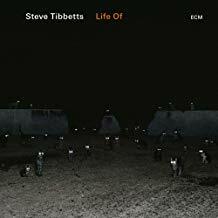 Life Of is an album that despite the relatively infrequent music making of Steve Tibbetts is well worth the wait for long time fans. For those just entering his singular sound world, it’s an appealing gateway– with the ECM catalog now on Spotify, listeners can check out his previous work with ease. For audiophiles, this album is a treat as Tibbetts mixed the album in the concert hall in Macalester College near his Minnesota home by placing 2 sets of microphones in the hall during playback to capture the rich ambiance. With one set in the center of the hall and one in the rear, it really captures a sonically rich and broad domain. Tibbetts’ guitar tone with it’s massive depth, fretboard squeaks and fretless like character are enough to captivate the listener for the entire duration of the album along with it’s meditative mood.